With regards to centralised HVAC heating and cooling systems, you will usually hear the terms Primary and Secondary circuits. 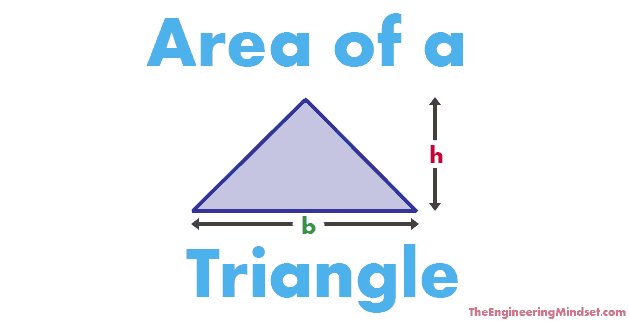 This refers to particular parts of the system which have a unique purpose. 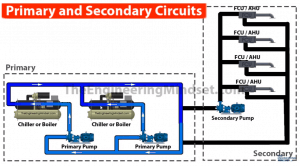 The Primary side of the heating or cooling circuit contains the boilers or chillers as well as the primary pumps. 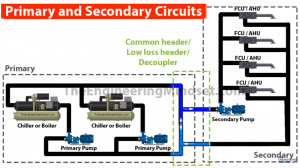 In this circuit the boilers or chillers heat or cool the water which is circulated around by the primary pumps in a continuous loop between the chiller or boiler and the low loss header. The secondary side of the system contains any of the plant items which transfer thermal energy into the rooms or equipment within the building. 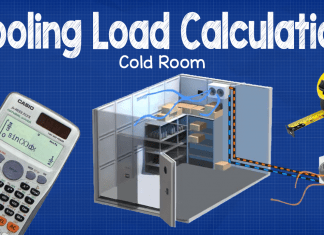 For example Fan Coil Units (FCU’s) Air handling units (AHU’s), Chilled beams or under floor heating as well as radiators etc. The secondary side can be made of multiple “secondary circuits” or just the one, this will vary with the design and load of the building. 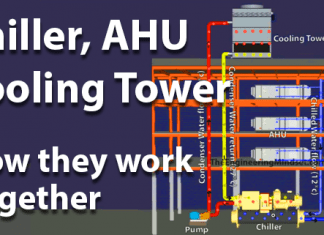 For example the AHU’s might be on a “Secondary circuit” and the FCU’s might be on another one, or different part of the building might also be separated to give better control e.g. North, South, East and West. Once the water flows through the secondary circuit and has transferred its thermal energy, it will return back to the low loss header and make its way back around the primary circuit. The primary and secondary circuits are connected via a pipe known as the “Low Loss Header” it is also sometimes referred to as the “Decoupler” or “Common Header”. 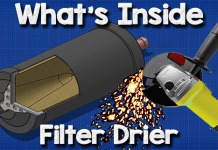 The primary water flows into this to provide heated or chilled water to the secondary circuits. When the building is at maximum load and is demanding 100% of the system’s designed capacity, all the primary water will flow into the secondary circuits. This is very rare though and is usually only 1% of the year. 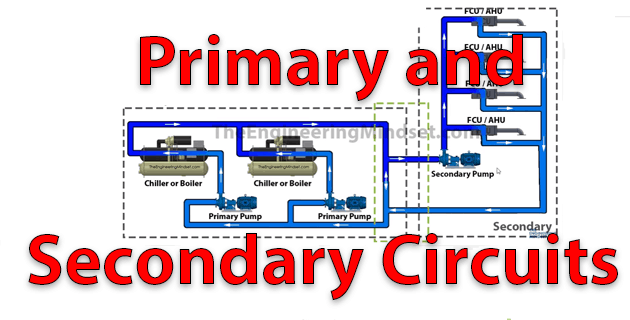 The other 99% of the year the system will be operating at part load, in this scenario only some of the primary water will flow into the secondary circuits and some will pass straight through and head back to the chiller or boilers. 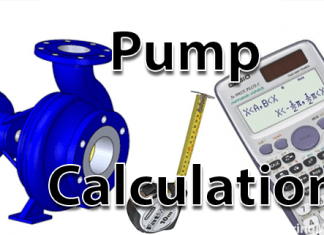 The primary circuit will often have pumps running at a constant speed. 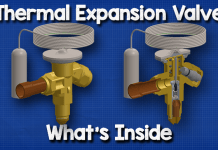 Newer designs may have variable flow primary pumps although a minimum flow rate must be ensured. 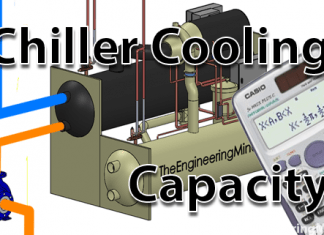 In both cases the chiller or boiler manufacturers will specify a minimum flow rate that must be achieved, if the flow rate falls below this, the chiller or boiler can freeze or overheat which may result in catastrophic failure. The secondary circuits will typically have a variable speed pump or a constant speed pump. Variable speed pumps will provide better energy efficiency and control as they can vary with the demand of the building. 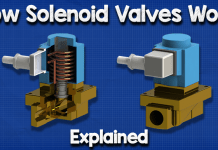 Pumps are often needed on secondary circuit to push the water around the building and overcome the frictional resistance of all the pipe fittings as well as the pipes themselves. Can you make a video on the comparison of single stage vs. two-stage water-cooled chillers? Thank you.